Anderson Process offers a number of mixers engineered to drive reliable production and help our customers achieve maximum operational profitability. Click or tap the bar above, then scroll, to view the industry-leading manufacturers we represent for each of our mixer technologies. Industrial Mixers Designed To Maximize Process Uptime. Ineffective mixing in fluid-handling operations results in inconsistent product quality, high rates of product loss, missed deliveries and unhappy customers. Today’s food, beverage, chemical, pulp, paper and wastewater applications demand industrial mixers that are properly specified and specifically engineered to optimize fluid dynamics. Without addressing the unique characteristics of the fluid being mixed, operators risk reduced production yields, increased maintenance costs and downtime. With more than a half-century of experience supplying processing equipment solutions, Anderson Process’s team of professionals are familiar with the challenges of industrial mixing applications. We consult with our customers to fully understand their mixing process — from liquid type and viscosity, batch volume and agitation requirements, to maintenance and sanitation considerations. We then recommend a mixer that will drive efficiency, minimize maintenance and increase production output. Anderson Process is proud to partner with two of the industry’s premier mixer brands — Hayward Gordon and Sharpe Mixers — to deliver a line of industrial mixers that maximize production uptime. These brands leverage quality construction materials and components in order to deliver high rates of mechanical reliability. Numerous configurations are available including top entry, bottom entry and side entry mixers with multiple motor, speed drive and gearbox specifications, impeller designs and surface finishes available. We collaborate with each of our customers to determine the combination of mixer options that will optimize your process’s efficiency. Whether you need a mixer to facilitate reactions in chemical processing, for blending or fermentation in food and beverage applications, or for agitating slurries in pulp and paper production, Anderson Process has a solution. 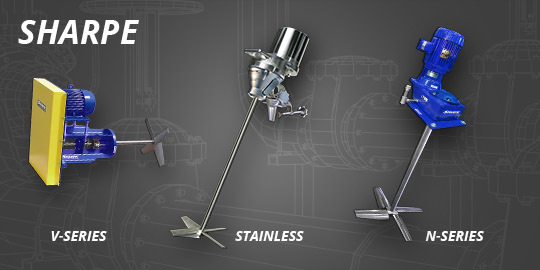 Our industrial mixers are both durable and reliable, ensuring proper mixing and maximum uptime to promote improved product yields and consistency.